The National Archives and Records Administration (NARA) is the nation’s record keeper. It is where the most important documents and materials created by the United States Federal government are preserved. 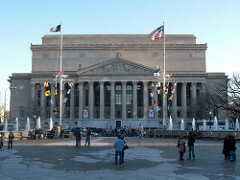 In addition, the National Archives provides free workshops and activities for people who want to attend. Their genealogy workshops are obviously geared for genealogists. They also have history workshops that might provide you with some insight about your ancestor’s lives. Here is a look at some of the workshops that will happen at various National Archives locations in March of 2017. The Census Records are quite possibly the most popular group of records used in genealogical research. Learn some new ways to use and decipher the golden nuggets of information within these documents. This workshop will take place at the National Archives in Fort Worth, Texas. This workshop provides an overview of the archival ways to preserve your family treasures. It will take place at the National Archives in New York, New York. Has a genealogical problem stumped you? Sign up for first-come, first-served 20-minute appointments at the Microfilm Research desk on Saturday. This workshop will take place at the National Archives in Washington, DC. Learn about using the Social Security Administration’s Death Files for genealogical research. This workshop will take place at the National Archives in Washington, DC. This workshop is one that is appropriate for the whole family. Come to the Boeing Learning Center for hands-on activities related to the Articles of Confederation. This workshop will take place at the National Archives in Washington DC. The workshop will take place on several days in the month of March. Author Scott Miller discusses new book about Allen Dulles. This event takes place at the National Archives in Washington, DC. The U.S book launch of Damian Shiels’s new book on the Irish in America. This event will take place at the National Archives in Washington, DC. Engage in family activities on the theme of friendship between nations. This workshop will take place at the National Archives in Washington, DC.